I'm having a relaxing afternoon making Wedding invitations, listening to music and drinking some leftover Kukicha tea. Lovely blue sky through the windows today too, which makes the winter so much more pleasant despite the cold! I'm also trying out a new infuser mug bought for me from my sister on her way back from Oman (thank you!). It's so useful as you infuse the tea in the top and you're left with quite a big mug of tea without having to wash up a teapot. 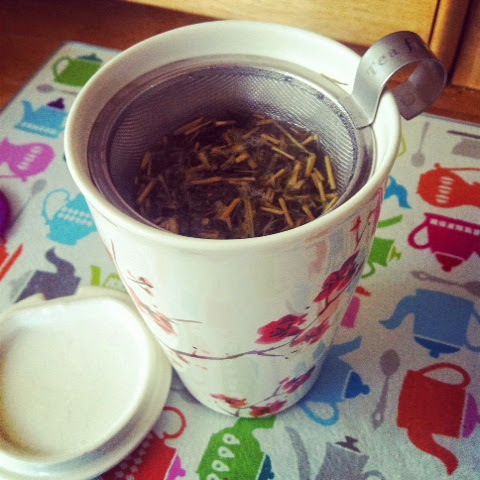 And as we know, loose tea is so much nicer than teabags! I've been off caffeine for a while so I'm glad to be back on a low caffeine green tea like this. Kukicha is also known as Twig Tea and that's because it's made of stems, stalks and twigs from the tea plant instead of just the leaves! It's tastes more of Japaense Sencha tea than China tea. I quite like it as it's quite creamy and sweet.